One of the true pleasures – no, the ultimate pleasure – of writing a column with a primary mission statement to unearth the real gems of small press and self-published comics is seeing those unique creative voices that you have actively championed becoming deservedly appreciated and acclaimed by a far larger audience. Just 18 months ago, for example, we were the first comics site to tell you that EdieOP was a name to watch out for when I reviewed her minicomics Jonah and Seven Blows to the Head here. Since then I’ve included her work in my annual “Ten UK Small Press Comics You Need to Own” round-up at Broken Frontier and marked her out as the outstanding emerging talent for 2013 when our colleagues at the Forbidden Planet International blog asked me to look back on that year here. 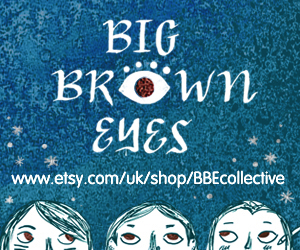 Her comic strips been seen in anthologies like ink + PAPER and Off Life, and this year she was nominated in the Breakout Talent category of our own 2014 Broken Frontier Awards. It was only a matter of time, then, before a perceptive and shrewd outfit would notice the brilliance of Edie’s dark and slightly twisted imagination, and it came as no surprise to me earlier this year when astute London micropublisher Avery Hill announced they would be bringing her first long-form graphic novel, Maleficium, into print. 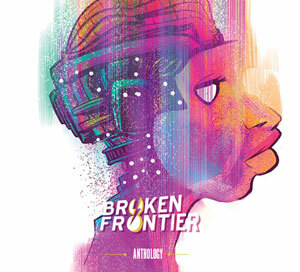 You can read a full interview with EdieOP at Broken Frontier here. So, for those of you who are not quite up to speed, here’s a quick recap of the worlds of EdieOP to date. Her comics exist in a strange realm that combines childlike innocence (both visually and thematically) with something almost cheerfully malevolent. Jonah, for example, tells a grotesque modern day parable on the extreme consequences of not feeding your goldfish, her strip ‘The Story of Lucius Jellybean’ in Reads Vol.2 #1 is the tale of the eponymous toxic character born of the bizarre union of a slug and a bacteria-ridden Petri dish, and her self-published Dangerfun is a series of vignettes of the hideously perilous scrapes that kids are constantly just one ill-advised game of ‘Chicken’ away from. 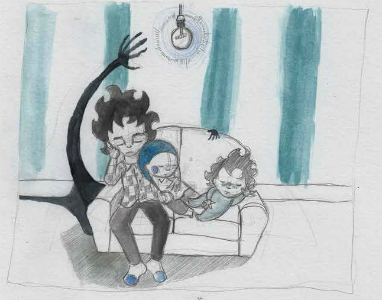 Maleficium focuses on young Huxley Leighton-Lomax, would-be boy wizard, who lives with his Dad and little sister Adelaide in what would otherwise be suburban normalcy if it were not for the strange malevolent force that haunts their home. For between its walls lurks a hungry, shadowy sentience that initially befriends the children but slowly becomes more frightening and malicious in intent. With a father oblivious to the extent of the threat in his own house can our pint-sized sorcerer-in-training send this supernatural horror back to its own dimension and save his family from its stygian clutches? While Maleficium symbolises a much warranted promotion of EdieOP’s comics, and from a boutique publishing house with a rapidly growing reputation all of their own, it also represents a significant shift in structural approach for this creator. Her work to date has never really exceeded minicomics length and, for all its disturbingly playful imagery, wicked inventiveness and twistedly teasing wit, we had yet to see anything truly resembling a full-blown narrative from Edie. That’s certainly remedied here with a full 90 pages of impish fantasy to immerse ourselves in. On a surface level the first thing that strikes the reader about Maleficium is its handsome production values. 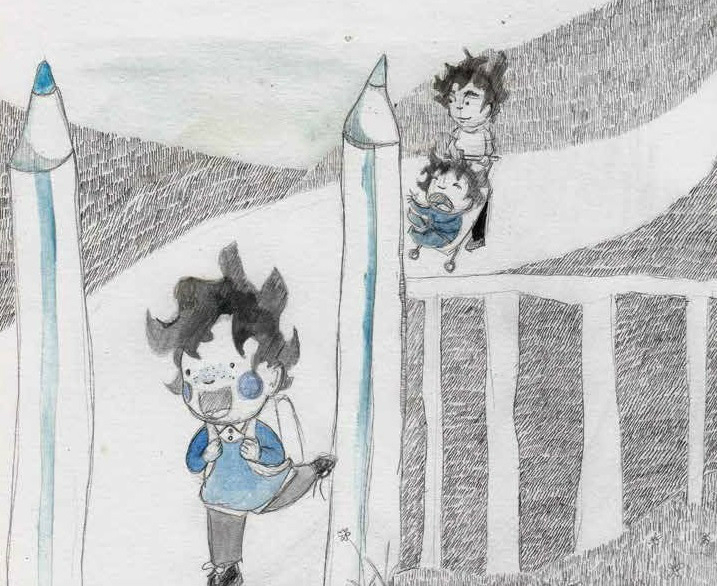 The larger canvas of its A4 presentation gives EdieOP’s art a chance to breathe and allows the reader to become fully absorbed in all the careful detail inherent in her misleadingly childlike caricaturing. As an object, there’s a tactile aesthetic to the book that underlines Avery Hill’s obvious belief in the material – a proud statement of intent that prestige work deserves a prestige format. Perhaps the greatest compliment I can pay to any aspiring all-ages storyteller is to observe that there are definite echoes of Sendak here. Not just visually but also thematically – that same feeling of childhood discovery, of the revelation of the magical in the mundane, and a similar sense of the dreaming world breaking into our reality. This storybook impression is reinforced by the lack of speech balloons for character dialogue, ensuring the narrative falls neatly into the aesthetic camps of both comics and children’s illustration. 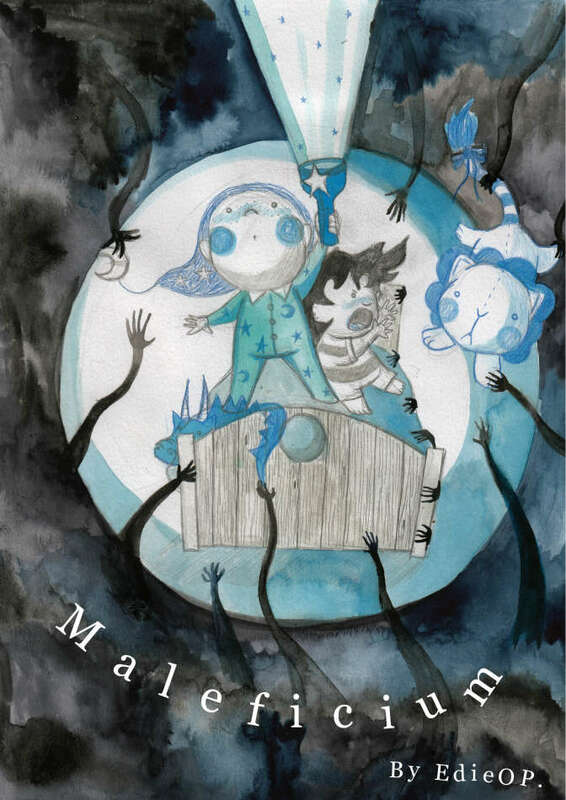 Which is most appropriate given that Maleficium’s echoing of classic standards of books for younger readers – all monsters in the closet and hideous presences under the bed – has such a contemporary fairy tale feel to it. EdieOP’s instantly endearing cast of players are rendered in a style that is simultaneously exaggerated to the point of distortion and yet resonantly recognisable. Indeed, you’ll seldom see such a prefect re-creation of the tics and traits of childhood as is presented in the pages of Maleficium; not to mention the beautiful evocation of the parent-child relationship herein. It’s the small details that make you realise just how gorgeously observed the characterisation is: the sequence where Adelaide is crying at the prospect of being parted from her brother as he goes off to school (left), for example, or the poignantly portrayed flip sides of sibling affection/rivalry throughout the book. It’s subtle and yet exquisite in delivery, adding an extra layer of humanity to Huxley and co, and ensuring the readership’s emotional investment in this appealing family of three. What ultimately makes this such a fun read, though, is that juxtaposition of the morbid and the slapstick. As our diminutive dabbler in the mystic arts attempts to free his loved ones from the thrall of the horrifying home invader he’s also dealing with an affable but woefully unaware parent and a largely helpless sibling. Physical comedy and otherworldly menace merge when dad Alexander comes a cropper from a craftily-placed toy on the stairs, for example, but these supernatural interventions still have a kind of cartoon violence to them; sinister and yet almost a little vaudeville at the same time. And that old standby of children being aware of an eerie threat that the adults of the tale summarily dismiss is played out to the full. 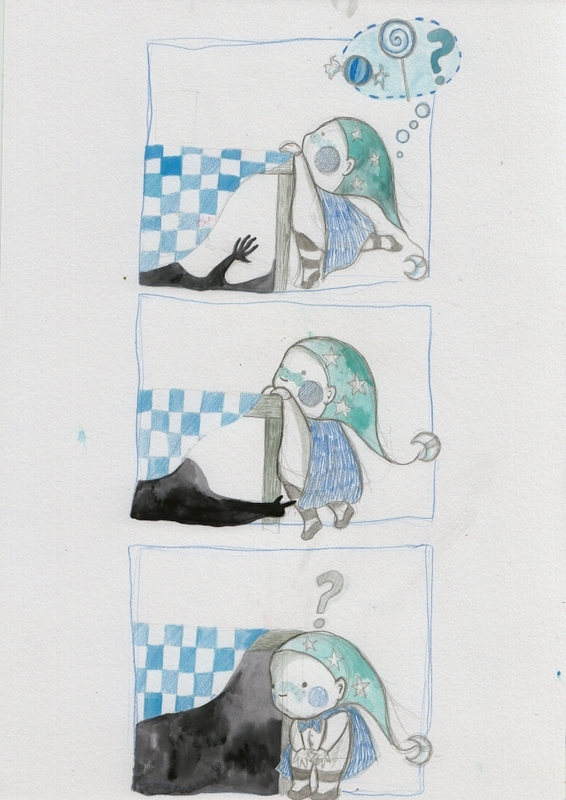 EdieOP’s muted use of colour is conspicuously effective in emphasising the atmosphere of nocturnal peril that lies at the heart of Maleficium, with the watercolour effects giving the perfect sensation of an iniquitous apparition able to bleed in and out of the shadows of every panel and page at a whim. There’s an innocence to the world she creates, though, despite all its creepy trimmings; a near celebration of that childlike perception of our environment that is honest, authentic and identifiable. Yes, the plot is essentially slight, and the ending may be a little too straightforward and pat for some readers, but Maleficium’s prime mission is about using the traditions of children’s storybooks in comic book form to weave an enchanting and all too familiar tale of childhood terrors come to life… not about labyrinthine narrative threads and ostentatiously sophisticated suspense. 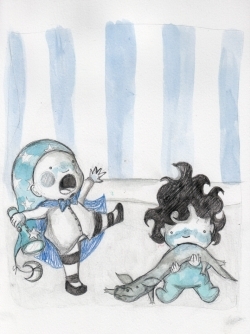 Here we have characters we fall in love with from the very beginning, a threat that plays on fears we can all empathise with, and an adorably feelgood factor despite the occult overtones of the subject matter; all wrapped up of course in that signature and slightly unworldly artistic style. With that prestigious Broken Frontier 2014 Award nomination announced this week, if you haven’t checked out the work of EdieOP to date then now would be a most opportune moment to do so. In Maleficium the Mistress of Mischief has proved that her ability to captivate and beguile her audience is just as pronounced in a long-form narrative as it was in her shorter style work. An outstanding graphic novel debut from a creator I have no doubt will be reaching an ever greater readership in years to come. Just remember… you saw her here last year on Broken Frontier first! For more on the work of EdieOP check out her website here. Maleficium is available from the Avery Hill Publishing site here priced £11.99. 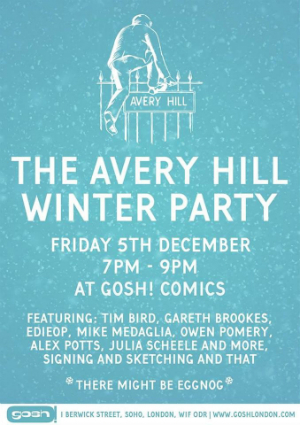 You can meet the Avery Hill team tonight (Friday December 5th) at London’s Gosh! Comics. Full details here.